Advent is observed in many Western Christian churches as a time of expectant waiting, self-examination, & preparation for the celebration of the birth of Jesus at Christmas. 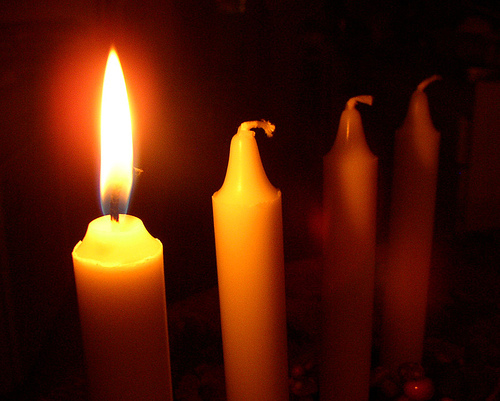 The name Advent comes from the Latin word Adventus, which signifies a coming. Advent has probably been observed since the 4C. It would seem that Advent could not have occurred, until the Roman Catholic Church & state decided to declare December 25 as the day of the birth of Christ, in 345. Advent was 1st recorded about 380 AD in Spain. As far back as the 5C, there existed the custom of giving exhortations to the people in order to prepare them for Christmas. The oldest document, the 2nd book of the History of the Franks by St. Gregory Bishop of Tours (536-594), states that St. Perpetuus, one of his predecessors, had decreed a fast 3 times a week, from the feast of St. Martin until Christmas. 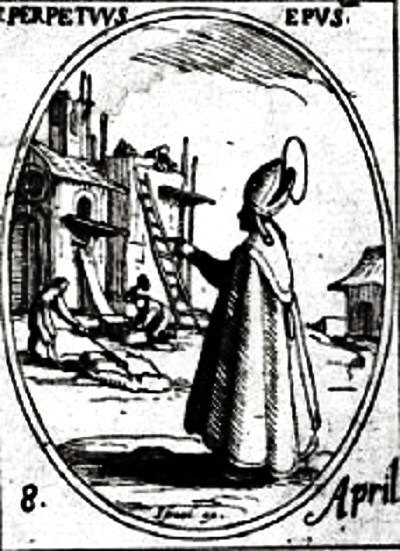 St Perpetuus, who died December 30, 490, was the 6th Bishop of Tours, from 460 to 490. It is unclear whether St. Perpetuus established a new custom, or merely enforced an already existing law. 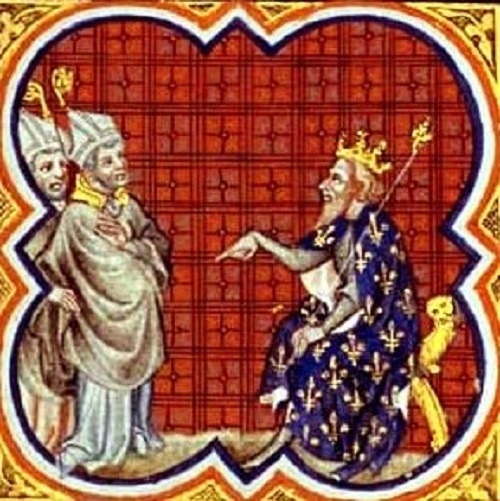 St Gregory, Bishop of Tours (536-594) & King Chilperic I, from the Grandes Chroniques de France de Charles V, 14C illumination. In the 4C & 5C, Advent was the preparation for the January "Epiphany" rather than Christmas. It was also a time for new Christians to be baptized & welcomed into the church, while existing members of the church examined their hearts & focused on penance. Religious leaders exhorted the people to prepare for the feast of Christmas by fasting. Early documents show that many church leaders treated Advent as a 2nd Lent. The 9th canon of the first Council of Macon, held in 582, ordained that between St. Martin's day & Christmas, the Mondays, Wednesdays, & Fridays, should be fasting days. In 567, the 2nd Council of Tours enjoined the monks to fast from the beginning of December till Christmas. The obligation of observing Advent, which, though introduced so imperceptibly, had by degrees acquired the force of a sacred law, began to be relaxed, & the 40 days from St. Martin's day to Christmas were reduced to 4 weeks. Sometime in 6C Rome, the focus of Advent shifted to the second coming of Christ. In the 9C, Pope St. Nicholas reduced the duration of Advent from 6 weeks to 4 weeks. The 1st mention of Advent's being reduced to 4 weeks is to be found in a 9C letter of Pope St. Nicholas I to the Bulgarians. After having reduced the time of the Advent fast, the church seemed to change the mandatory fast into a simple abstinence & required only the clergy to observe this abstinence. The Council of Salisbury, held in 1281, seemed to expect none but monks to keep it. On the other hand Pope Innocent III, mentions that, in France, fasting was uninterruptedly observed during the whole 40 days. By degrees, the custom of fasting fell into disuse; and in 1362, Pope Urban V asked only that the clerics of his court should keep abstinence during Advent. In his 4th Council, he enjoins the parish priests to exhort the faithful to go to Communion on the Sundays, at least, of Lent & Advent; & he strongly urges them to fast on the Mondays, Wednesdays, & Fridays, at least, of each week in Advent. And finally, sometime in the middle ages--approximately the 1500's--an additional focus on the anticipation before Christ's birth was added to that of His 2nd coming. Today Advent in most Christian churches begins on the Sunday nearest November 30, & covers 4 Sundays. Because the day it begins changes from year to year, so does the length of each Advent season.